Casa Rinconada is located in the Chaco Culture National Historical Park in northwestern New Mexico. The name Casa Rinconada comes from Spanish for "cornered house" or "house where the canyons meet". The Park Service has an online document 'Chaco Canyon Place Names' where you can look for more information on the topic. In contrast to the great houses of Chaco Canyon the Casa Rinconada site is an example of an outlying community with a great kiva and several small villages. 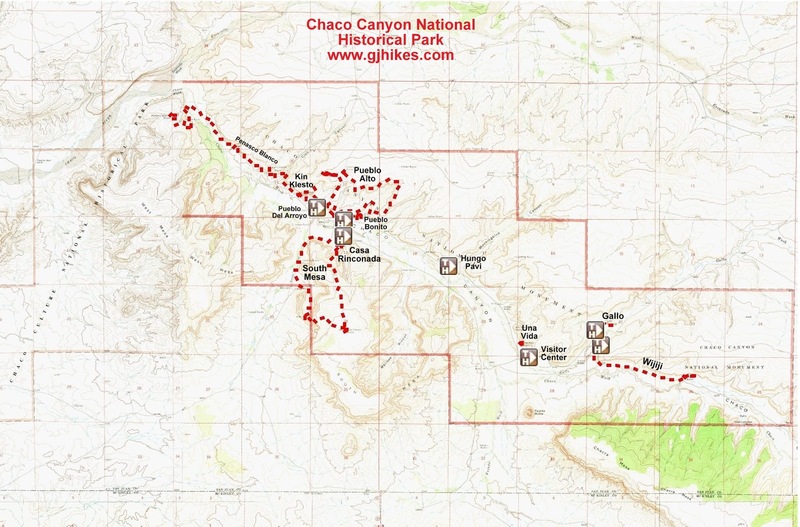 The trailhead is located about 6 miles from the Visitor Center on Canyon Loop Drive. The parking area is shared with the South Mesa and Kin Kletzin trails. The Parks Service website mentions that people in wheelchairs would need assistance and looking at this hill you can see why. This trail leads up to the great kiva which is the crowning stop at Casa Rinconada. The trail is hard packed but it does have a few rough spots and a some steeper sections. The great kiva at Casa Rinconada shares a few similarities with the great kiva at Aztec National Monument such as the 2 doors at opposite points of the kiva and the antechambers. The keyhole shape of the doors with their lower tapered sides bares some resemblance to an 'ankh' the Egyptian symbol for eternal life. Following the trail to the south from the great kiva leads to the junction of the Kin Kletzin trail. There are 3 separate villages in the immediate vicinity of Casa Rinconada. This excavation shows how new buildings were often built on top of older construction. Here you can see that was the case at least 3 times in the past. It is estimated that approximately 50 villages were concentrated between South Gap and North Gap with similar clusters of villages found nearby. The thinner walls of these smaller domiciles are quite the contrast to the thick massive walls of the great houses. We saw two separate herds of elk in Chaco Canyon. This bull was in the company of about a dozen cows and calves. Oddly enough none of the other visitors seemed to notice the elk at all. One herd was grazing the grassy hills very near to Casa Rinconada. While visiting the great houses at Chaco Canyon the brochures mention that archaeologists don't think that very many people actually lived at those sites. They were mostly used as public buildings for ceremonial and trade purposes. That isn't much different at all from our use of public buildings today. Sites like Casa Rinconada would have been where most of the people did live and perform their daily functions of growing crops and making tools, clothing and pottery. If you would like to see it for yourself then all you have to do is 'Take a hike'.